Herschel Walker, Former Professional Football Player. Advocate for Mental Health. Motivational Speaker. 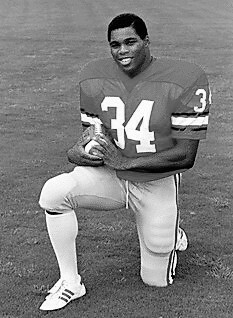 Herschel Walker grew up outside of Wrightsville, Georgia, and in high school, excelled at football, basketball and track and field. He scored a record-breaking 85 touchdowns as a running back and led his teams to state championships in both football and track, while maintaining an A average. At the University of Georgia, Walker set an NCAA freshman rushing record and helped capture the national collegiate football title. He earned consensus All-American honors three consecutive years, set 10 NCAA records, 15 Southeast Conference records, 30 Georgia all-time records, and capped a sensational college career by earning the 1982 Heisman Trophy in his junior year. In 1983, Walker gave up his final year of collegiate eligibility and turned professional, joining the New Jersey Generals of the short-lived United States Football League. Walker dominated the league, earning Most Valuable Player honors and setting the single-season pro football rushing record. After his first pro season, he finished his Bachelor of Science degree in Criminal Justice at the University of Georgia. Walker joined the Dallas Cowboys in 1986, where he led the entire NFL in rushing and earned All-Pro honors. He moved to the Minnesota Vikings as starting running back in 1989, and in 1992 he joined the Philadelphia Eagles, eventually returning to the Dallas Cowboys in 1996. He retired from the NFL in 1997 as one of the league’s top running backs, gaining more yards than anyone in professional football history at the time, counting his seasons in both the NFL and USFL. Walker supports numerous charitable and educational organizations. In 1981, he became the first Academy of Achievement honor student to return to the annual program as a recipient of the Golden Plate Award. In 2002, he was voted into the Collegiate Football Hall of Fame, and was selected as the second greatest player in college football history, just behind the legendary Red Grange. Herschel Walker is the author of Breaking Free, a memoir in which he shares the inspiring story of his life and diagnosis with dissociative identity disorder — from the joys and hardships of childhood, to his explosive impact on college football, to his remarkable professional career. He gives voice and hope to those suffering from DID. Herschel shows how this disorder played an integral role in his accomplishments and how he has learned to live with it today. His compelling account testifies to the strength of the human spirit and its ability to overcome any challenge.